An operator is any symbol which used to perform operation on a value and produce new value. NEW TERM an operator is a symbol that manipulates one or more values, usually producing a new value in the process. echo "The first number is " . $var1 . " echo "The second number is " . $var2 . " echo "The third number is " . $num3 . " Both are same either "and" or "& &". echo "This is first condition"." == Check two values equal? === Check two values equal in both value and data type? > Check first value larger than the second value? >= Check the first value larger than or equal to the second value? < Check the first value smaller than the second value? <= Check the first value smaller than or equal to the second value? !=, <> Check the values not equal to each other in value? echo $var1 . " is less than " . $var2 . " echo $var1 . " is equal to " . $var3 . " echo $var1 . " is identical to " . $var3 . " First add 8 to 3 to produce 11, then multiply the result by 2 to produce a final figure of 22? Or should it multiply 3 by 5 first to get 15, then add 8 to make 23? Now operator precedence play important role. 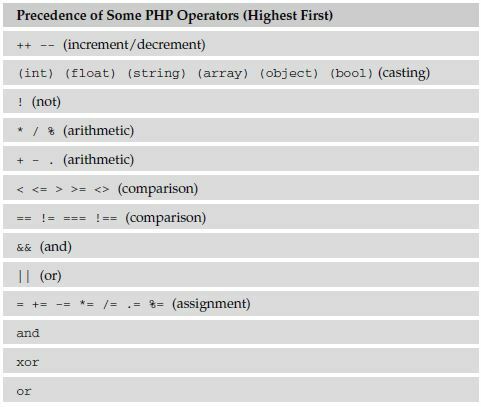 All PHP operators are ordered according to precedence. echo "Value of first exp:". $a."